How would you order triggered abilities when creatures die? Perilous Myr is a pet card of mine, but it would do well here. 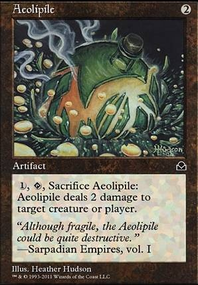 Goes infinite with Enduring Renewal and Ashnod's Altar . Not a lot of synergy with the rest of the deck but he's a fun little guy. So, trying to put together a soft lock together for Lich's Mastery . Platinum Angel with Lightning Greaves + Darksteel Plate , Lich's Mastery , Enduring Renewal , Spore Frog , Phyrexian Metamorph (copying Spore Frog ), Clone (copying Spore Frog , or if you wanted to be cheeky, copying Phyrexian Metamorph copying Spore Frog ), and Lich's Mirror & in play, with ways to gain life in hand. Am I missing something? In a 4-man pod I can't die here right? 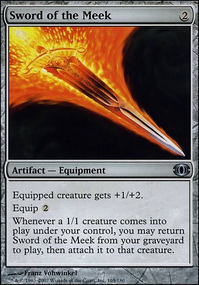 Enduring Renewal can be a backup to Athreos, although it has some drawbacks, but those can be played around if you play with recursion. patrikl Enduring Renewal is weird and I'm not too familiar with it. 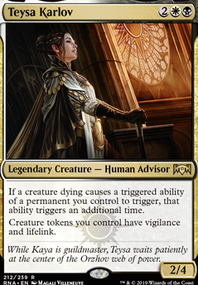 It does combo with phyrexian altar or a sac outlet and pitiless plunderer to death-loop a 1 mana creature, and it gives a lot of value when we already have an advanced board-state. However, it can easily backfire and disallow us from drawing into some creatures we need. It's similar to Reassembling Skeleton in that it loops creatures. From what I can tell at the moment, it seems worse because of its potential backside when the upside is only that it can loop for 1 mana less. I might be wrong however, and further testing might prove the upside is better than I thought. Another deck that has more recursion than mine might be able to take advantage of how it fuels the graveyard. It also might be funny to test it with Ornithopter for a free death loop. Wow, thanks for addressing all my points and trying out most of the cards I suggested. I have tried to optimize my Shirei list and those are great performers there. Now I don't have much experience in white for this kind of deck so I wanted to ask you What are your thoughts on Enduring Renewal ? It can loop a 1 mana creature with Phyrexian arena but I don't know if the drawback is worth it or if it even adds enough to the deck. Some changes for anyone interested; not enough to make an update about it so I'll comment instead. Liliana, Heretical Healer Flip - While she's very good, just just didn't do anything well enough for me. Still on the radar though. Fallen Ideal - I decided it needs too many things on the board to actually be good. Diabolic Intent - Besides my personal dislike of tutors, it's not good early because I don't have enough early tokens. I think I'd rather have draw. Burnished Hart - Great ramp, and with a little recursion(especially Sun Titan ) it is amazing. Lingering Souls - Trying to up my early token count. 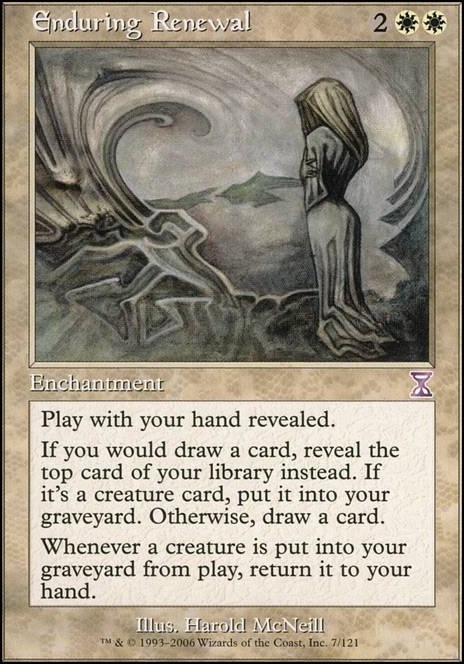 Necropotence - Draw to replace the tutor. It hurts my small discard theme, but only effects three cards overall and let's be honest, the benefits of necropotence still outweigh those downsides. I have Reliquary Tower and Thought Vessel as well which make it even better. Plus, I own a copy, whereas I don't have any of the cards I removed. Enduring Renewal - the combo potential was there but was too hard to work around. Hurt my draw too. ShreddedByCrows thanks for the upvote and comment! Most of your suggestions I have not included because of price. In the case of Grave Betrayal, too high cmc. Ethereal Absolution / Night of Souls' Betrayal / Tainted AEther + Akroan Horse / Infernal Genesis / Alliance of Arms etc, just not what I want to do I suppose, too much to work around. Forbidden Orchard is nice, I'll consider it. I do however, really like Enduring Renewal . It's a tough work around but combos with Deathrender at the cost of no mana... I will have to play around with it. Thanks again!